Is your favorite sports event has started or is it about to come? Then you must be looking for a sports bar that gratify your needs of enjoying the season in a perfect sporty environment, good ambiance and great food along with some socialization. If your answer is a ‘Yes’, then there are numerous sports bars in Dubai that could be a response to your hunt. Dubai is unquestionably a metropolitan which celebrates every bit of life and its seasons, festivals, sports, carnivals, holidays or any other type of commemorations. Dubai offers a great number of sports bar that offers you the best options of food, drink, socialization, etc. to thoroughly enjoy your hot sports event. Visiting these sports bars is one of the recommended things to do in Dubai at night. 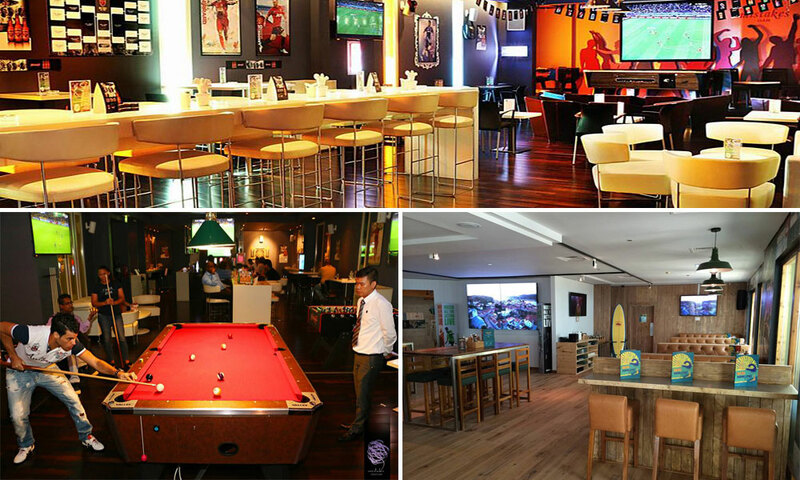 Here revealed are the best five sports bars in Dubai, which offers you the best variety in all such features, so pick one from the list that clicks you rightly for this sporty season. Barasti is one of the most famous beach sports bars in Dubai, which has 10 enormous size screens that display each and every sporty activity that is buzzing around the town ranging from Cricket and Football to Tennis and Chess. This place truly has everything, whether it is good food, casual setting, dynamic bar and relaxing ambiance. This place has 10 medium sized indoor screens, 2 gigantic indoor screens and 1 giant size outdoor screen as well. The place celebrates happy hours every day between 4pm to 7pm during which you can avail several discount and deals too. You can also enjoy Shisha over the pool and beach side tables. The Barasti is sited at Le Méridien, Mina Seyahi Beach Resort & Marina, Al Sufouh Road. For details dial +97 (4) 399 3333. Pool side with tables and private section available to be hired, Biber Lounge is absolutely a place to be for a perfect casual and sporty night out with your friends. Located at the Rixos – Palm Jumeirah, this sports bar in Dubai has 4 medium size screens and a private scope with a bigger screen that can be hired to share a specified gathering. You can enjoy the happening events of your favorite sports here, including Cricket, Rugby, La Liga Soccer, Rugby Union, Formula 1, Rugby League and Darts etc. The Biber Lounge is located at The Palm Dubai – Jumeirah. Dial +97 (4) 457 5454 for details. Bidi Bondi is an Australian venue with casual bar and terrace settings. The place is particularly lively on weekends with a substantial crowd of people who stays at the place after brunch. This Dubai sports bar offers you to enjoy your up-to-the-minute sports event on their two enormous screens, of which each is placed outdoor and indoor. Apart from two gigantic displays they have 13 big size LEDs showing Rugby League, Premier League Football, Golf, Formula 1 Racing, Tennis, Cricket, Rugby League, Moto GP etc. Bidi Bondi offers special deals for the weekend which include a combo of 5 drinks or a meal with 4 drinks for AED 130. This offers validates only on Fridays and Saturdays from 12:00 pm to 7:00 pm. The Bidi Bondi is located in Buildings 3-4, Shoreline Apartments, Palm – Jumeirah. Dial +97 (4) 427 0515 for further details. In spite of its name, this bar doesn’t commit any other mistakes with regard to enthralling its visitors. Arranged in a loco boutique inn, you’ll discover awesome beverages and friendly services alongside scope of all the most recent major sports events. The place incorporates 7 big screens displaying various sports such as the World Cup, Rugby, Cricket, Football etc. The place also offers numerous happy hour deals between 7pm to 10pm starts from AED 25. You can also enjoy playing chess, darts and foosballs there. It is located in the Hues Boutique –Deira Corniche, Al-Bahara. For details dial +97 (4) 603 4810. This sports bar is all set to the conventional American theme and offers everything that you expect for a perfect night out including good food, music, drinks and great people too. On Sundays, you can enjoy their amazing acoustic guitar sessions by ‘117’ which is a local house band. This place charms you with 14 massive TV screens displaying a wide range of sports events including Cricket, Tennis, Rugby and Bundes Liga Football. You can also enjoy a great range of drinks deals only for AED 25 between 6pm and 3am. You can also avail a discount of 20% daily between 6pm to 8pm on regular beverages; and can also enjoy a bucket of hops every Wednesday between 6pm to 3am only for AED 120. Champions Sports Bar is the proud of JW Marriott Dubai, which is located on Abu Baker Al Siddique Road- Deira. Dial +97 (4) 607 7977 for details. These are some of the best sports bars in Dubai to catch a live streaming of your favorite match. Be it Soccer, Cricket, Rugby, Formula 1 or any other sporting events, these sports bar shows live matches on gigantic screens. If you have experienced one of the above mentioned sports bars and would like to share your experience, please do so by adding comments below. How can I get in touch to include another sports bar? Hi Richa, Which Dubai sports bar you want to recommend? Please advice. I’d like to include Original Wings and Rings, located at DIFC.